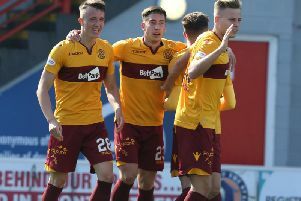 Motherwell boss Stephen Robinson was delighted yet stunned by Carl McHugh’s sensational Scottish Cup last eight winner against Hearts. And Robbo now wants his men to win next month’s semi-final against either Aberdeen or Kilmarnock as a tribute to the ’Well skipper, who will miss the game through suspension after being booked against the Jambos. Robinson said: “I never saw the goal coming on Carl’s right foot, no. “He was excellent today Carl and he has been. “He maybe doesn’t get the plaudits that he deserves. “The job he does in front of our back four and the headers and tackles and the organisation he gives us is excellent. “And I think he got his just rewards today. “Unfortunately he is going to miss the semi. “He’s been booked, which is a travesty for the boy. McHugh’s brilliant 25-yard volley was just one aspect of a game Motherwell bossed for long spells after controversially having Chris Cadden’s early goal chalked off by referee Andrew Dallas who deemed Cadds had kicked the ball out of the hand of keeper Jon McLaughlin while the ball was on the ground. “I thought we were superb first half,” Robinson said. “I thought our intensity and our desire in the first half and some of our play – right in their faces – we’re a very good team when we do that. “Hearts came on strong in the second half. They had a 20-minute spell where they dominated the game and Trevor Carson pulls out an absolutely world class save. “But we didn’t let the disappointment of the decision early on get to us and we know that we’re a strong, fit team. “We made positive substitutions and I genuinely thought we deserved to win the game.